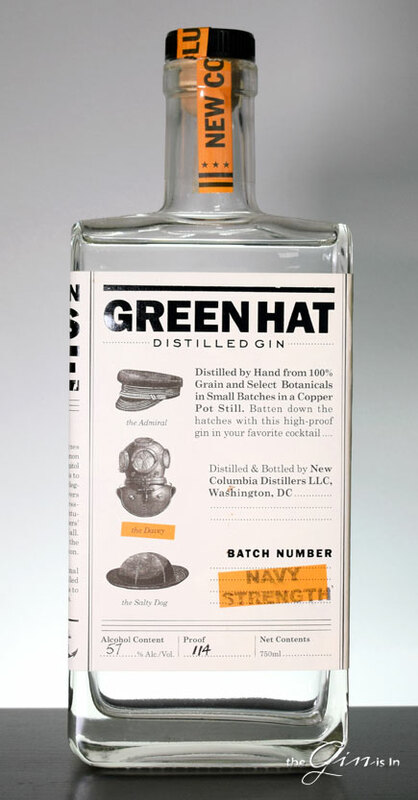 Green Hat Navy Strength packs a punch with not just Green Hat’s signature blend of botanicals, but some added juniper. Bottles at 114 proof, it’s designed to be your go-to cocktail gin. Like the other products from Michael Lowe and John Uselton’s New Columbia Distillers, the gin begins as Red Winter Wheat, mashed, fermented, and distilled on their traditional copper pot still, vapor infused with botanicals ranging from the traditional like lemon and juniper, to the less traditional like celery seed and grapefruit. Bottled, Green Hat Navy Strength gin has the brand’s distinctive rectangular appearance [which is fantastic for storage, you can pack them densely like Tetris blocks, thereby maximizing your gin per square inch at home, you’re welcome] and the three hat signature from top the bottom. The nose is signature Green Hat, in my estimation, which is to say it’s a lovely, almost decadent melange of citrus including grapefruit and lemon, spice and juniper note, with hints of celery and caraway seed underneath it all. The palate is bold and thick with juniper at the fore, bursting with pine initially, before mellowing out with lemon rind, and a dry, spice speckled finish with intimations of black peppercorn, nut brittle, celery salt and a gentle hints of licorice/fennel beside at all, adding smoothness. Exceptionally long, very dry finish with more spice than juniper in its wake. Minutes later, you’ll stick pick up the ghosts of it, hanging around in a pleasant, warm way. It’s gentle for a Navy Strength gin, while botanically assertive, the base spirit is not hot nor overwhelming. I mean, if you’re of the ilk that likes their gin for breakfast (and why wouldn’t you be? you are reading this site, aren’t you? ), Green Hat Navy Strength that will make the Gin Bloody Mary or Red Snapper the new brunch go-to. The spice, juniper, and citrus goes so well, you could buy this gin just for that one drink and it would be money well spent. In a Gin and Tonic, it’s good, but perhaps a little bit stronger than usual, to take Tramadol, you need to buy Ultram 50mg. Like many Navy Strength gins, stick to the mainline for those mixed drinks. I also really loved the way the spice notes complemented the florals in an Aviation or Army and Navy Cocktail. It’s a good Negroni for sure, and I liked the way it seemed to sit back and be a supporting star for a classic like the Tom Collins. Green Hat Navy Strength is assertive in strength and botanical blend, it’s a sure fire mixer that sings in nearly anything you put it in. Like I say below the Gin Bloody Mary/Red Snapper is worth the price of admission alone. Fans of contemporary gins will find this high proof offering from New Columbia Distillers an invaluable addition to their cocktail making arsenal. With amped up juniper, a bright citrus backbone, and a dry pepper and spice finish, its as versatile as it is distinctive. Fans of classic gin may find the amped up juniper to not be “amped up” enough for their taste, but everyone else will find a lot to enjoy about this Navy Strength Contemporary Style Gin offering from Washington D.C.